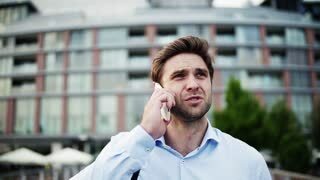 A hipster businessman with smartphone walking on the bridge in the city, making a phone call. Slow motion. Hipster businessman with laptop bag, suitcase and smartphone walking in park in London, making a phone call. Slow motion. Hipster businessman with smartphone walking in park in London, making a phone call. Slow motion.